Hosterdam Review 2019: Is Hosterdam a Good Hosting? Slovenian host Hosterdam is a member of RIPE NCC, the regional internet registry for Europe, West Asia, and the former USSR. This host offers one choice of web hosting along with VPS and domain registration services. Despite its Dutch-sounding name, Hosterdam is not located in Amsterdam. This is the web hosting brand of Slovenian company SIEL, d.o.o. 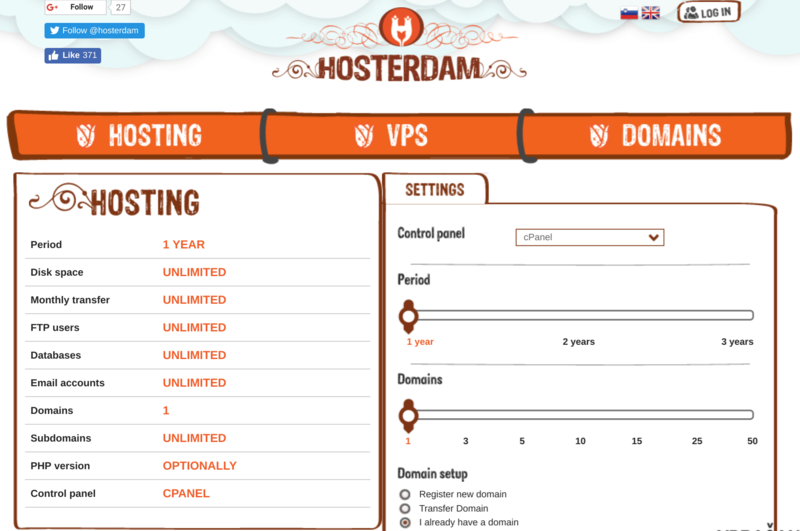 Hosterdam’s website can be switched between the Slovenian and English languages, and it presents you with a very simple set of services: a single slightly-customizable hosting plan, a very customizable VPS plan, and domain registration. When you purchase the plan, the customizable settings include the control panel (actually, only cPanel), the hosting period (1 to 3 years), and the number of domains (from 1 to 50). Hosterdam’s services are backed by a redundant (duplicated) infrastructure that includes two redundant power supplies and multiple redundant internet connections. As an alternative to hosting, you can purchase a VPS plan that allows you to customize almost everything including the Linux flavor, control panel, disk capacity, memory capacity, CPU, and the number of IP addresses. Hosterdam’s single web hosting plan is priced fairly when you consider that the prices already include VAT and you get lots of unlimited resources. Although you have to commit for at least a year, the 15-day trial period gives you two weeks to try before you buy. You can reach out to Hosterdam’s support team by telephone, ticket, email, or live chat. The phone and live chat channels are only available during Slovenian office hours, which is a little restrictive. The live chat window tells you if an agent is available, but my attempt to connect was unsuccessful, possibly because I asked my initial question in English. Self-help can be sought from the FAQ page and the Hosterdam Wiki, but don’t expect to learn too much before you have to contact the company for additional information. If you’re looking for a single very simple hosting plan that doesn’t require you to make too many choices, then Hosterdam could be your perfect host. Wondering how Hosterdam stacks up against other Web Hosting companies? Enter any other Web Hosting company and we will give you a side-by-side comparison.